I can't speak for the default feature set but I've now installed two of these devices as wireless access points running Tomato (shibby) firmware. The first was a v1 device (4mb flash) and the second was v2 (8mb flash). No external antenna; however, the signal is great and it makes the device much slimmer and it blends in nicely with existing media hardware.This is the cheapest router ($23 and $30 depending on the sale) I've been able to find on NCIX that supports third party firmware. Highly recommend. Bought this to replace my old Belkin that spent its time losing connection to my cable modem.Took me three minutes to setup my whole wireless access, including exceptions, port address ranges etc.The software is very easy to use and the help topics are clear. Overall a good router, would buy again if I need a router to put in my living room that I can connect my HTPC or WD Live! Tv to. I bought this router for a friend who had a standard 5 port router that was not wireless, he needed a basic wireless router for his PS3 since he didn't want to use ethernet. He set it up without my help and used the CD to aid him. He is not super techy or anything; has nothing to do with networking or computers. With the Linksys E1200 Wireless-N Router, Easily connect more entertainment and office devices to your home network and enjoy Gigabit speeds. The Linksys E1200 offers fast speed to connect your computers, wireless printers and other Wi-Fi devices at transfer rates up to 300 Mbps speed. Built with leading 802.11n wireless technology, the Linksys E1200 offers reliable range to create a powerful wireless network. MIMO antenna technology provides broad coverage so you can enjoy your wireless network from anywhere in your home. 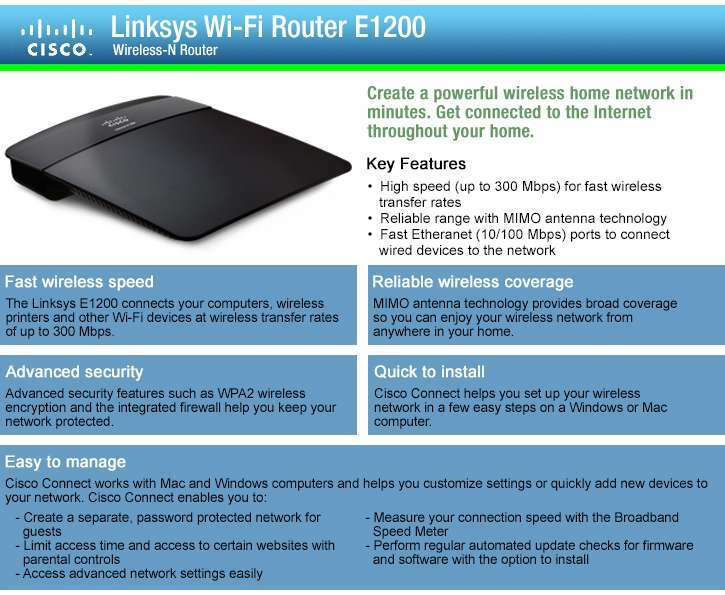 Purchase the Linksys E1200 Wireless-N Router today. Fast Wireless Speed - The Linksys E1200 offers fast speed to connect your computers, wireless printers and other Wi-Fi devices at transfer rates up to 300 Mbps speed. Reliable Wireless Coverage - Built with leading 802.11n wireless technology, the Linksys E1200 offers reliable range to create a powerful wireless network. MIMO antenna technology provides broad coverage so you can enjoy your wireless network from anywhere in your home. Advanced Security - Keep Wi-Fi freeloaders and Internet threats at bay with WPA/WPA2 encryption and SPI firewall to help keep your network protected. 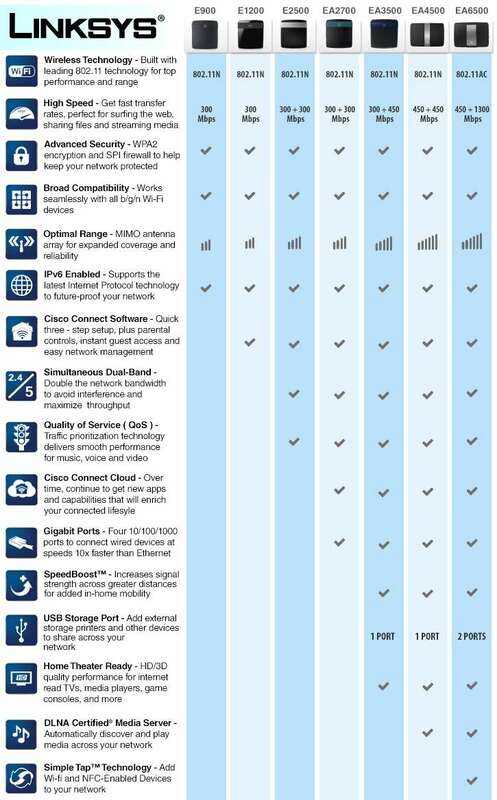 Quick to Install - Cisco Connect software helps you set up your home wireless network in three easy steps.